United States Special Operations Command (USSOCOM) desires the ability to rapidly generate 3D data from multiple imagery sources. USSOCOM currently lacks the capability to generate timely 3D data from multiple imagery sources at the speed of operations. This leads to 3D data being underutilized for a variety of SOF users and mission sets where time is of the essence. The goal of this effort is to develop software and hardware that uses new and/or enhanced methods for processing sensor data in order to both expedite processing time and take advantage of non-traditional sensor data as as source for model development. 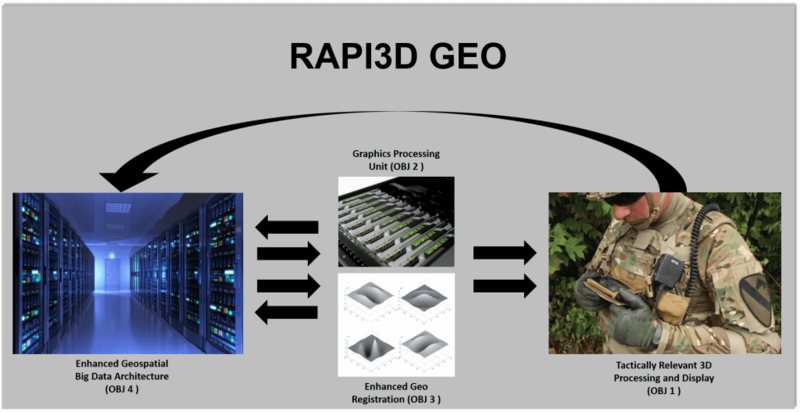 Delivered solutions will be part of the 3D GEO Rapid Capability Insertion (RCI) composed of four objectives: (a) Tactical, (b) Graphics Processing Unit (GPU), (c) Geo-Registration, and (d) Scale. Vendor may bid on one or more solutions Tactical, GPU, Geo-Registration, and Scale are each considered a solution. Estimated Request for Solutions (RFS) Release Date: February 2019. Active TReX membership will be required to submit a solution for this soon to be released RFS. To start or update your TReX membership application and registration, please visit the TReX membership portal: TReX Membership. Any questions regarding this soon to be released opportunity should be directed to: initiatives@nstxl.org.